1,Liangjiang brand- manganese carbonate industrial grade, adopting direct acidification method for soft manganese ore powders (two-ores method), oft manganese ore is Calcined into manganese oxide and then acidification, reduced the calcination process, greatly saves equipment investment, reduce the pollution of the environment, and reduce the cost.The appearance is rosy, triangular crystal or amorphous bright white brown powder.Relative density 3.125.Almost insoluble in water, slightly soluble in water with carbon dioxide.Soluble in dilute mineral acid, slightly soluble in ordinary organic acids, insoluble in alcohol and liquid ammonia.Stable in dry air.When wet, it’s easy for oxidation, manganese sesquioxide will be informed, gradually becoming dark brown, then emitting carbon dioxide by thermal decomposition. Shanghai Liangjiang titanium white products co., LTD. Production of manganese carbonate is widely used in telecommunications equipment is used as the material of ferrite, desulfurization catalyst, enamel paint, varnish drier, manganese salt catalyst manufacture and raw materials.In fertilizer, medicine, machinery parts, and also need to use the manganese carbonate in phosphating treatment.Agricultural use manganese carbonate as trace element fertilizer its content can be slightly lower. 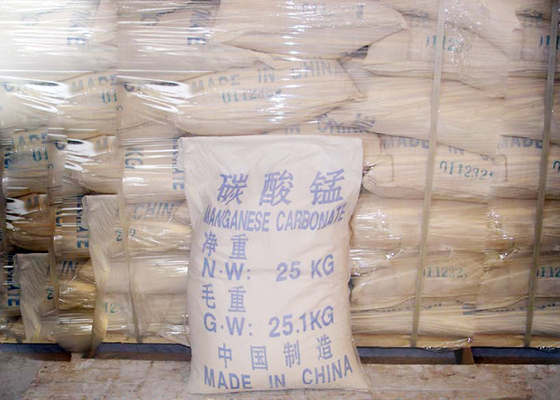 2,The main raw materials of Liangjiang-brand industry grade Manganese carbonate are pyrolusite and pyritic. The two materials reacted with sulfuric acid, and through the process deironing, wiping off other heavy metals to get manganese sulfate solution. Then neutralize the solution with ammonium bicarbonate to get final manganese carbonate products.